The increasing cost of research means that scientists are in more urgent need of optimal design theory to increase the efficiency of parameter estimators and the statistical power of their tests. The objectives of a good design are to provide interpretable and accurate inference at minimal costs. Optimal design theory can help to identify a design with maximum power and maximum information for a statistical model and, at the same time, enable researchers to check on the model assumptions. Introduces optimal experimental design in an accessible format. Provides guidelines for practitioners to increase the efficiency of their designs, and demonstrates how optimal designs can reduce a study’s costs. Discusses the merits of optimal designs and compares them with commonly used designs. Takes the reader from simple linear regression models to advanced designs for multiple linear regression and nonlinear models in a systematic manner. Illustrates design techniques with practical examples from social and biomedical research to enhance the reader’s understanding. 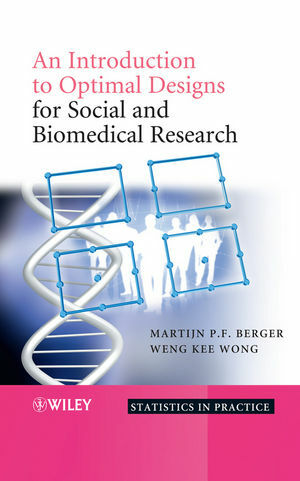 Researchers and students studying social, behavioural and biomedical sciences will find this book useful for understanding design issues and in putting optimal design ideas to practice. Professor Berger has been teaching and conducting research in this area for over 20 years. He has an extensive collection of publications to his name, including articles in a wide range of journals, a contributed chapter in Wiley's recent Encyclopedia of Statistics in Behavioural Science, and the 2005 book Applied Optimal Designs, co-authored with Weng Kee Wong. One of the leading experts in the US working in this field, Professor Wong is currently conducting grant-funded research into making optimal design methods more accessible for practitioners. As well as co-authoring Applied Optimal Designs, he has published over a hundred refereed articles, in numerous journals. He has held the position of Associate Editor for many such journals, including a current, second 3-year term for Biometrics.